The Golden Cocker Retriever, also known as the Dakota Sport Retriever, is a hybrid dog made up of the Golden Retriever and the Cocker Spaniel. This breed originated in the United States. The Golden Cocker Retriever stands from 14 to 19 inches tall and can weigh anywhere between 20-60 pounds, though the average weight is 30-45 pounds. The Golden Cocker Retriever is considered a long-haired breed but they do shed less than the average Golden Retriever. The most prominent color is gold, by the Golden Cocker Retriever can come in all colors and patterns. The Golden Cocker Retriever loves water and to play fetch. They are playful outdoors and calm while inside. This breed is very gentle and loving family dogs. They can be trained to hut upland birds and/or water fowl. The Golden Cocker Retriever loves water and to play fetch. They are playful outdoors and calm while inside. This breed is very gentle and loving family dogs. They can be trained to hut upland birds and/or water fowl. The Golden Cocker Retriever is a soft-tempered breed. This is a people-oriented breed and form strong bonds with their owners. You can find Cogol puppies priced from $799 USD to $1800 USD with one of our credible breeders. Browse through our breeder's listings and find your perfect puppy at the perfect price. The Golden Cocker Retriever is a soft-tempered breed. This is a people-oriented breed and form strong bonds with their owners. The Golden Cocker Retriever should be brushed on a weekly basis and bathed when needed. Their ears can be trimmed twice a year to avoid matting. The Golden Cocker Retriever has a strong desire to please and are not difficult to train. They respond best to a gentle, but firm trainer. Harsh commands should be avoided as this breed is best motivated by praise, toys and treats. The Golden Cocker Retriever loves to play and should be exercised on a daily basis. 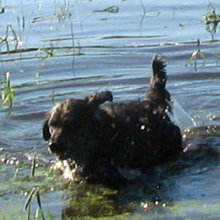 This breed is happiest when playing fetch and/or swimming but will do just as well with a long walk. Cogol Puppies for Sale - Shipped Worldwide! Finding the right Cogol puppy can be dog gone hard work. PuppyFind® provides a convenient and efficient means of selecting and purchasing the perfect Cogol puppy (or Cogol puppies) from the comfort of your home, 24 hours a day, 7 days a week. Take advantage of our PuppySearch or leisurely browse our directory of hundreds of dog breeds, Cogol dog breeders, Cogol dogs for adoption, and Cogol puppy for sale listings with photos and detailed descriptions. Some Cogol puppies for sale may be shipped Worldwide and include crate and veterinarian checkup. Many Cogol dog breeders with puppies for sale also offer a health guarantee. With thousands of Cogol puppies for sale and hundreds of Cogol dog breeders, you're sure to find the perfect Cogol puppy.